Round-trip train tickets and seat reservations, entry to Beatles Story exhibition, Beatles Magic Mystery Tour, city map & info. Monday to Friday London/Liverpool/London by Train All Year. Scroll down to the bottom of this page for details and prices of the Beatles London half day and/or full day tours. Monday Tuesday, Wedns., Thursday, Friday (April to October). Arriving in Liverpool Lime Street after a relaxing train journey, explore the Victorian city and the Albert Dock Complex and stroll along the waterfront admiring this historic city. Your unescorted tour includes ticket to The Beatles Story, where you can experience the most sensational story the pop world has ever known! The Cavern Pub and Club is the most famous club in the world. 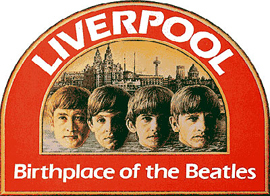 Liverpool is dedicating many memories to the lives of The Beatles, their homes, schools, birthplaces, Penny Lane, Strawberry Field and many other landmarks. In the afternoon your 'MAGICAL MYSTERY TOUR' is waiting to take you away. This two hours tour takes you around all the lanmarks in the lives of the Beatles. Mendips & Fortlin Road was the childhood homes of John Lennon and Paul McCartney and both houses are now open to the public. The Jacaranda is the coffee bar owned by Alan Williams and a regular haunt of John Lennon and Stuart Sutcliffe. To avoid disappointment, always email us with your dates before booking any train tours, as we need to confirm with you dates availability. ONCE BOOKED, ALL TRAIN TOURS ARE NON-REFUNDABLE. The Beatles in London half day or full day Bus Tour (Availability to be adviced). Morning Tour: Audio-guides will help you to discover London Rock 'n Roll - Summer of Love - the Psychedelic Connection - Ringo's House - Paul McCartney's Gold Disc & where he wrote 'Yesterday'. Afternoon Tour: Classic Rock Beatles 'Sixties Swinging' places that inspired Beatles lyrics - Abbey Road Recording Studio - Monsters of Rock homes: David Bowie, Jimy Page, Van Morrison & Jimi Hendrix.